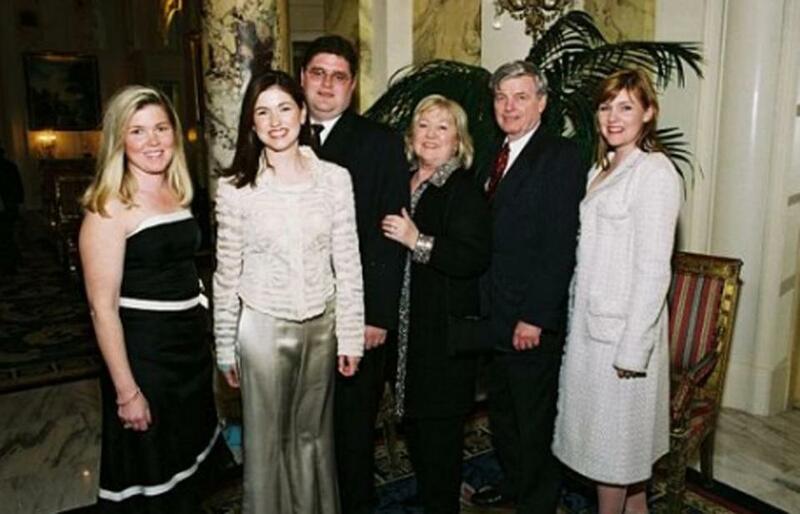 The Martin family, pictured at the 125th anniversary gala for Newton Country Day School of the Sacred Heart in 2005. One way reporters find interesting stories is tips from readers, and the tip I recently received about the James G. Martin Memorial Trust left me wondering: 14 years after the Globe Spotlight Team investigated financial abuses by charitable foundations, has the situation improved? The $4 million Martin trust, created in 1977 and based in Rye Beach, N.H., is a private foundation, which typically means it was set up by a wealthy family or individual who gets large tax breaks for putting aside money for charitable causes. My tipster had this damning opinion: “Clearly, the primary purpose of the foundation is to provide a comfortable income to the three daughters,” who live in Massachusetts. Since at least 1998, the daughters of its donor, Gerard “Jerry” M. Martin, 82, a former nursing home executive, have been listed as foundation employees working about 40 hours a week. In return, the women — Marianne Burke of Wellesley, Marilyn Parker of Jamaica Plain, and Michelle Pesaresi Martin of Newton — are each paid up to $115,000 annually. They receive that six-figure compensation, and are described as working full time, despite the foundation making donations to only about a dozen organizations annually, on average, and in one year as few as five. In some years, the daughters have been paid more than was donated. In 2013, for instance, they collectively made $347,000 in salary and benefits, while the foundation gave $230,000 to seven organizations. Over the past 18 years, the foundation has donated $6 million and paid the daughters more than $5.3 million. What’s more, the donations usually go to the same dozen or so organizations, with the largest often given to the family’s alma maters, such as Newton Country Day School of the Sacred Heart and Boston College. Meanwhile, Marianne Burke is listed as “proprietor” and “managing partner/funeral director” of Henry J. Burke & Sons Funeral Home in Wellesley, raising questions about how she can devote 40 hours a week to the foundation while running a business. “Bottom line,” the tipster wrote in an e-mail, “a man pays his daughters $350,000 year to write checks to the same 6-10 nonprofits every year,” and is eligible for a charitable tax break on what he pays them. Every dollar his children receive means less money going directly to charities. I tried to get the trust’s side of the story, but neither trustee Gerard Martin nor his daughters responded to my requests for comment. When asked about the daughters’ pay, Marabella said, “I shouldn’t be talking to you,” citing “a privacy issue,” and declined to comment further. In 2003, when I was a Spotlight Team member, we wrote a series of stories about financial abuses at private foundations, and the failure of regulators to address the problem. Among our discoveries: foundations paying trustees more than $1 million a year and using charitable assets to fund a $63,000 sports car, $200,000 wedding, and $36 million jet. Compared to that, how eyebrow-raising is the Martin Memorial Trust? I put that question to a former IRS official who didn’t want to be identified but had this to say, based on my summary of the foundation’s finances: The money going to the Martin daughters is “not your traditional holy-crap dollar amount” relative to what some other foundations pay their employees. “But whether it’s an example of a violation” is unclear, the official added. “That’s typical IRS — they don’t do any regulating!” Pablo Eisenberg, a senior fellow at Georgetown University’s Center for Public & Nonprofit Leadership and fierce critic of the philanthropic sector, said of the former IRS official’s comments. The Martin Memorial Trust “may not be the most egregious example” of financial misconduct, “but it’s a pattern where small foundations and their families take advantage of lax oversight,” Eisenberg said, noting that IRS staff cuts have severely handicapped the agency’s ability to monitor charities. He called the Martin foundation “a double dip” because the donor can get a tax break of up to 30 percent as his children simultaneously benefit by being paid out of foundation assets. More than a decade after Spotlight’s reporting on private foundations, little has changed, Eisenberg and others say. Due to IRS budget cuts and the financial decline of newspapers, which has resulted in fewer investigative reporters, “oversight of the nonprofit sector, including foundations, is so minimal these days that it almost amounts to nothing,” Eisenberg said. Case in point: There are about 85,000 private foundations in the United States, but last year no more than 231 of them were audited by the IRS. On the state level, resource-strapped attorneys general are similarly ill-equipped to oversee charitable entities. Hopkins said that to determine whether pay is reasonable you must take into account the individual’s expertise, education, training, and time devoted to the job. However, “making grants to essentially the same entities every year,” as the Martin foundation does, “is not as much work as making grants to new grantees every time around, where you have to do site visits and there’s more effort involved,” Hopkins said. The foundation says it provides scholarships, but there’s little evidence of that, other than a few modest ones granted more than a decade ago. Furthermore, its tax filings show that Gerard Martin or his late wife, Kathleen R. “Kay” Buckley Martin, have signed all donation checks, raising more doubts about what role their daughters play. Meanwhile, the foundation’s tax return from last year identifies Kathleen Martin as one of its three trustees, even though she died in 2013. The third trustee, Richard Solano of Melrose, Mass., did not return calls.